The event attracted more than 2500 people this year. The organisers took steps to tighten entry requirements for the professionals to deliver the best presentations on variety of hot industry topics. 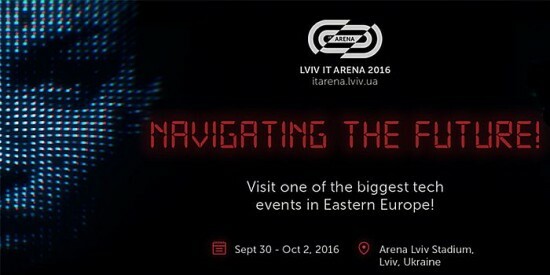 Lviv Arena kicked off with a keynote speech by state administration officers and chief IT executives. The event featured top speakers from Uber, Microsoft, IBM, Deloitte, Twitter, Spotify, Telefonica. Like previous year, the action was divided into three streams: Technology, Business and Product. Business. The participants shared their experience in strategic outsourcing for business growth, trends in outsourcing, new directions for business growth and collaboration with foreign companies. Product Development. The stream brought together technologists, designers, business analysts, project managers and QA experts to discuss digital and phygital products for product companies or end-users. Technology. This stream focused on technology innovations, methodologies, and best techniques and tools to create value for customers. Dedicated zone called Tech Expo was a unique exhibition on modern technologies and new products in IT industry, including ones from Ukraine. In 2016 Tech Expo focused on the best hardware technologies in 3D printing, robotics, drones, wearable technologies, augmented & virtual reality, smart home solutions etc. Lviv Arena has lately become a focal point for a new wave of startups in Startup Competition. This desk challenged startupers in front of entrepreneurs, investors, business angels and tech fans with on-stage interviews and the pitch battle. TEAM International was present at the conference as Lviv IT Cluster member. We installed an instant photo booth, so that everybody could capture the moment of the event. To sum up, the Conference gave attendees the opportunity to learn from world-class experts, and to network with industry influencers. On top of that, it provided participants with the chance to get inspired and energised. Source: TEAM International Services Inc.